If at this juncture you’re wondering what on Earth a ‘Patapon’ is then don’t fret. You obviously missed this rhythmic treat back on the PSP – and sadly you’re hardly alone there. But now that you’re all PS4-equipped you have the power. The power to pata-pata-pata-pon! 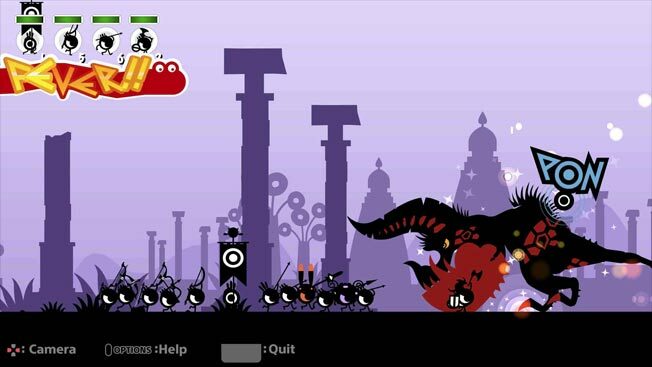 Patapon is a rhythm game that collided heavily with both a god game and a strategic outing. You’re the big god-diddily-like deity type, and these little silhouetted folks are your pixel puppets. Please be nice to them? They’re ever so sweet and eager to please – all you have to do is keep the beat. As such, you stab buttons which represent taiko drums. Initially there’s ’pata’ and ‘pon’. Master these and you’ll be presented with ‘don’ and ‘chaka’ – and we’re not talking Mr ‘No Soul’ Simmons or Ms Khan. In fact, if you’re the former you won’t even get to that point, as the more you remain rhythmic, the more your disciples will dig it. Your aim? Assail the Jiggadon army – and a bunch of stupid big dumb hurty boss monsters - all in the name of rhythmic zen. On top of these basics, you can go all Dr Frankenstein with collected materials to concoct new battalion-bolstering Patapon. The more crazy powerful an army you create, the more (and quicker) those enemies fall to their defeated knees weeping. Rhythmically, of course. Being a remaster, not everything’s woo- yeah, woo-yeah. Cutscenes remain untouched by human – or Wacom - hands. As such they’re blurrier than Damon, Graham, Alex and Dave in their heyday. Some scenes are even weirder, being a mishmash of old and new. The main game screens, however, look ace. Many have whined about input lag, but playing in normal mode on an LG OLED we had no issues. Maybe we’re just the rhythm royalty that these funky little Patapon peeps believe us to be?